Get Creative: Create a modern or rustic custom design to use your walls more efficiently, to store your liquor bottles, and to decorate your walls. While you can create a customized wall décor of your most expensive wine bottles, you can also replicate the high-end designs you see on Pinterest for a fraction of the cost. Charming Design: The wrought iron wine rack works like a charm to hold your bottles, to decorate your walls and to create storage space for your delicate, treasured and expensive liquor collections. You can store your wine, vodka, whisky, and other beverages with ease. Easily reach for a bottle and pour yourself a glass to sit back and relax after a long day at work. Great Gift Idea: The adult beverage holder rack makes a great gift idea for any occasion, while it is ideal for a housewarming gift, you can purchase the set of 5 bottle holders as a Christmas gift or for a bridal shower and it promises not to disappoint. Product Measurements: 5 3/4" x 3 1/2" Wall Bracket to Rack: 2 1/4"
5 Wine Bottle, Liquor, Adult Beverage Holder Racks and Mounting Hardware, Each Rack Comes with 4 Plastic Stoppers. Showcase: If you're a wine connoisseur and have discerning taste in adult beverages, you now could stylishly present your taste in wine and other beverages, with the help of the hanging floating wine racks you can easily choose a special wine for your guests when they come over for dinner. Display: Turn your empty walls into a work of art and create an efficient storage space for your small, medium or large liquor bottles, get your bottles out of kitchen cabinets, wine cellars, garage or basement and keep it where you can see it, your empty walls will look marvelously functional. Decorate: The set of 5 self-standing wine rack can be staggered on one wall space, used in different spaces or it can be designed to your taste. The customizable decoration will turn your wine storage into a fun and more affordable storage solution. 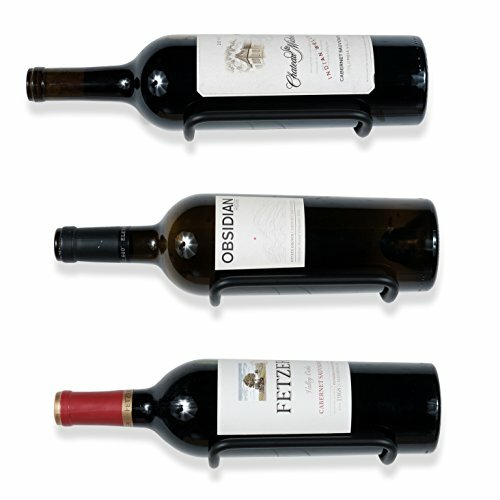 Minimalist: The simple design space saver bottle rack comes with 4 plastic stoppers to hold your wine bottle intact; the heavy-duty iron, solid and sturdy wine rack will keep your most cherished adult beverages where you can see safe and sound. Inexpensive: The kitchen or dining room wine storage bottle racks are not attached together, you can purchase the set of 5 for a reasonable cost and create a design that looks high-end, the good craftsmanship guarantees lifetime satisfaction.